Wild Child, indie-folk pop band from Austin, Texas, began as an acoustic duo consisting of Kelsey Wilson and Alexander Beggins singing ukulele love songs written and shared over red wine and old photographs. The two met for the first time just three days prior to a six-week tour with a Scandinavian band and instantly became enamored with their new life on the road. With northern U.S. parks and fields as their backdrop and a tour van as their practice studio, Kelsey and Alexander formed their first ten songs, flawlessly documenting the ups and downs of a less than idealistic yet enchanting romance. 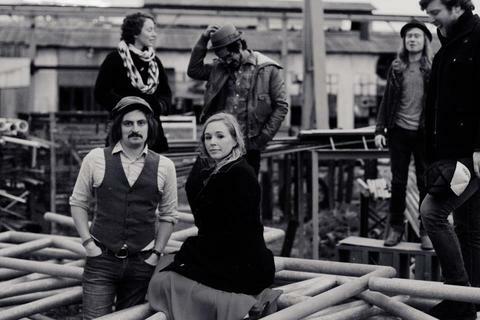 Wild Child has evolved since then into a six-piece band, accenting the soulful vocals and folk-influenced instrumentation with lush strings, keys, bells, banjo and percussion. After returning from the tour in November of 2010 and recording lo-fi demos of their songs on an old 8-track recorder, Kelsey and Alexander spent the next few months working on pre-production with the help of Anthony Erickson of Eye in the Sky Collective. San Francisco producers Evan Magers and Alex Peterson traveled to Austin at the beginning of March 2011 to begin recording the full-length album. Following a month of rehearsing, recording, and making their SXSW debut, Kelsey, Alexander, Evan and Alex returned to San Francisco to finish tracking the album and spent the subsequent months mixing at Major Nation Studio in Austin. In the midst of the recording process and in anticipation of their SXSW debut, Wild Child added drummer Carey McGraw, cellist Sadie Wolfe, keyboardist Evan Magers, and multi-instrumentalist Matthew Mares to inject their own unique influences and playing styles into the mix. Wild Child has fostered their growing reputation by performing regularly at venues and festivals throughout central Texas, including Emo’s, the Texas Music Theater, Wild Frontier Fest, and Art Disaster 13. Wild Child's debut album, 'Pillow Talk' (Major Nation), was released in October 2011, and drew instant acclaim from a wide variety of national publications and blogs. "An album of anthemic proportions" (indieshuffle.com), 'Pillow Talk' features 15 tracks full of gorgeous harmonies, tempered rhythms and conflicted lyrics about love and loss. Ranging from the dazed and nostalgic "Silly Things" to the waltzy and wishful "I'll Figure You Out," the songs tell a rich tale of inconvenient matters of the heart with an irreverent, playful innocence and deceptive musical simplicity. From the somber and sweet "Darling Divine" to the rambunctiously infectious "Cocaine Hurricane," the chemistry among the band is palpable and unique—sweet and youthful on the surface, but frenzied, unruly and fiercely honest underneath.